You’re coming to Vietnam – you’ve read about the street food, you’ve heard about the street food, but will you try? You may be on your way here, telling yourself “Of course, I’ll try it!”. But to be honest, upon first arrival, you may become wary of what you’ll actually try. There’s not likely to be a menu in English and it is more unlikely that the staff will speak great English. But it’s precisely this simplicity, the subtle variations by regions and the fresh ingredients, that keep you pulling up a plastic tool for more. From Lamborghinis to Louis Vuitton, District 7 is just a hair different than the rest of Saigon. This is where the wealthiest of the city’s residents reside – mainly Western, yet some Korean and Vietnamese as well. The streets are wider and less congested, the blare of the city is long gone, the sidewalks are unusually clean. The food is as well. There are many places for you to choose ranging from food stalls to high-end restaurants. Here is the list of amazing places that you can enjoy delicious in District. Follow us and satisfy your appetite! 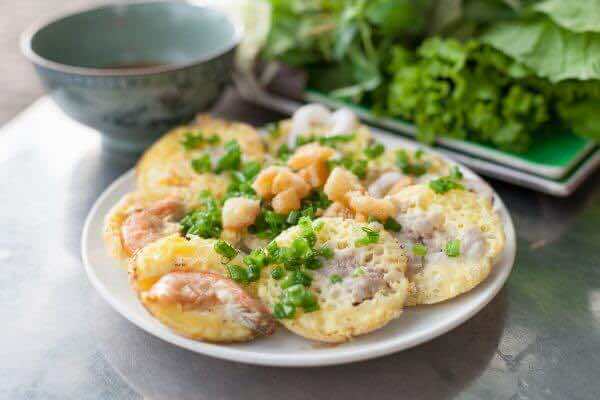 Banh can – This cake is made of pure rice with the optional fillings of spring onion, eggs, shrimps, squid, minced pork… What makes it special is that the cake is cooked in a small earthenware pots without oil. When the cake is well-cooked, it is crispy. This dish is served with slight fish sauce, meatballs and crackers on top. 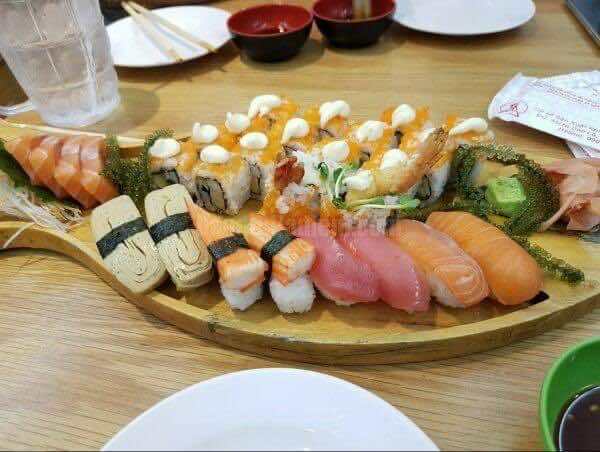 Sometimes, it is served with a special dipping sauce made from small fish. Banh xeo – A good banh xeo is a crispy bulging with pork, shrimp, and bean sprouts, plus the garnish of fresh herbs that are characteristic of most authentic Vietnamese dishes. 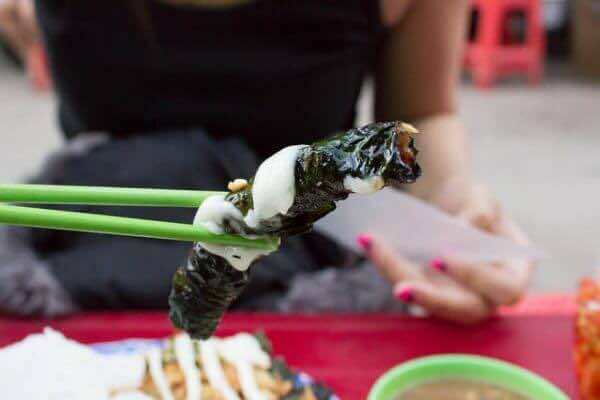 To enjoy one like a local, cut it into manageable slices, roll it up in rice paper or lettuce leaves and dunk it in whatever special sauce the chef has mixed up to you. 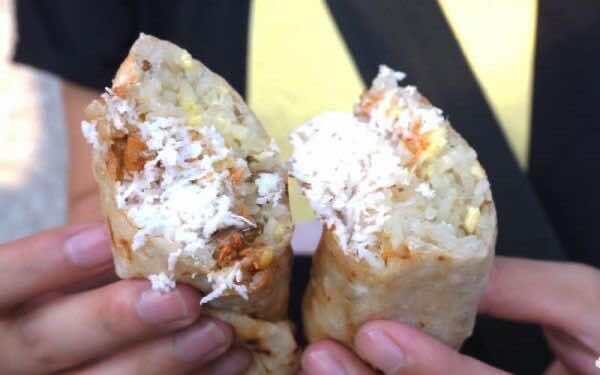 The size of banh xeo varies throughout the country as well, and the biggest version can be found down south, in Saigon. 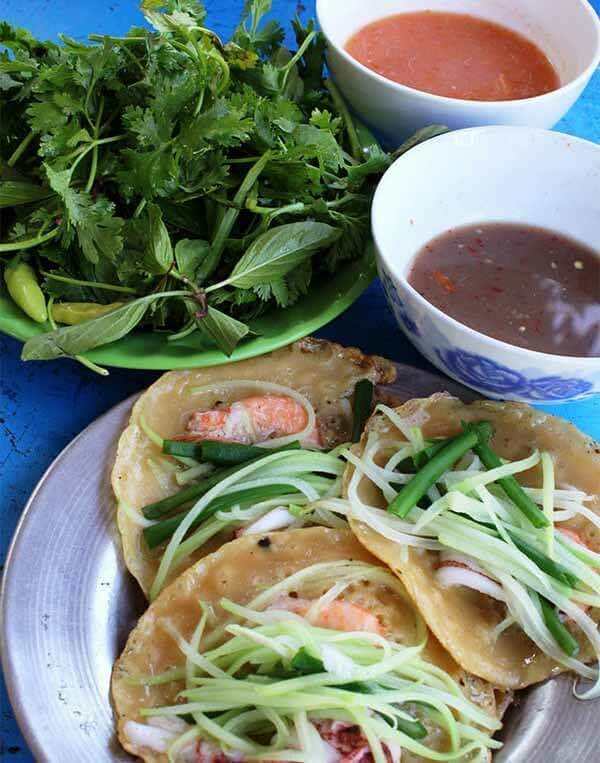 In this place, you can find the smaller version of banh xeo – banh xeo Phan Rang. But goes one step further than its other Phan Rang contemporaries in the sauce department. Phan Rang Quán – 407 Le Van Luong, Tan Phong Ward, District 7, HCMC. 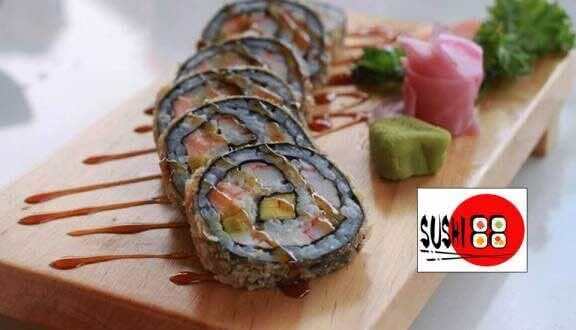 Sushi 88 – 43-45 Nguyen Thi Thap, Him Lam Resident Area, Tan Hung Ward, District 7, HCMC. Steamed sticky rice has become one of the most popular foods in Vietnam because it is cheap and delicious convenient food. 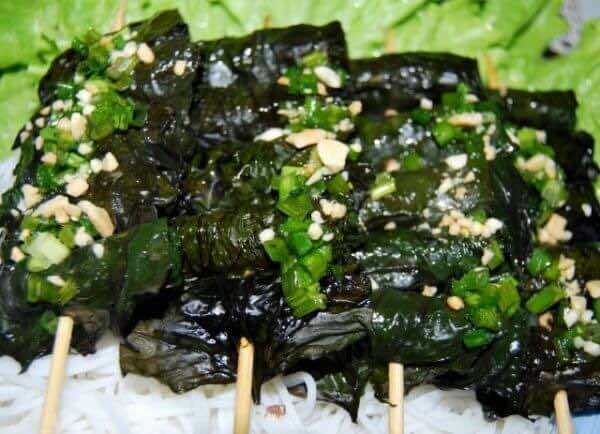 Vietnamese people has eaten this food for decades since they could sticky rice. In Saigon – the biggest city of Vietnam, you can find hundreds of steamed sticky rice stalls on the streets. I would like to introduce you a xoi stall which is famous for the combination of mung bean sticky rice and durian. The steamed sticky rice topped with durian, peanut, sesame, coconut, sugar. All is wrapped carefully in a special kind of rice paper. Xôi sầu riêng – at the corner of Lam Van Ben and Nguyen Thi Thap, District 7, HCMC. Chao is the name for Vietnamese rice congee, and though there are many different types, with pork and pig organs being extremely popular, there’s another version called chao vit, congee made with duck. Something is that the congee and duck are served with a plate of Vietnamese salad, a mixture of finely sliced herbs and vegetables, dressed in a light sweet and sour fish sauce. The vegetables go extremely well with the salty rice porridge and the succulent duck. Cháo gỏi vịt Út Be – 237 Le Van Luong, Phuoc Kieng Ward, District 7, HCMC. Bò lá lốt Tân Quy – 47/20 No2, Tan Quy Ward, District 7, HCMC. Also a type of rice vermicelli like pho, and similar in structure, mi quang possesses a completely different shade and flavour. 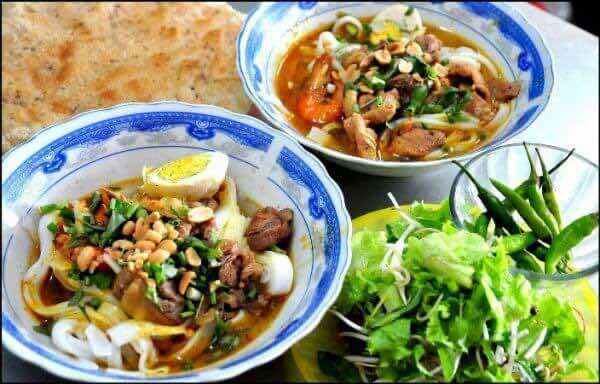 As the name implies, this noodle is a specialty of the Quang Nam province. 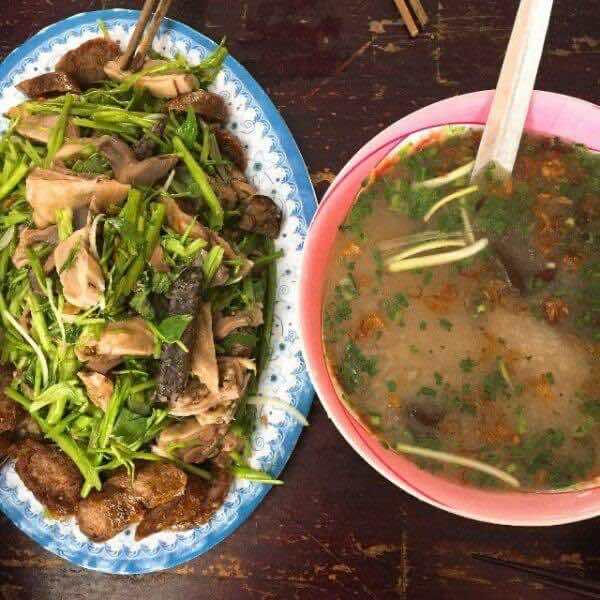 And just like other dishes that have originated from Central Vietnam, this is a very sophisticated dish, full of flavours. A bowl of mi quang consists of noodles, shrimp, pork, chicken, roasted peanuts, quail eggs, fresh herbs, and only a little amount of broth. Don quán – 56A No10, Tan Quy Ward, District 7, HCMC. If you want a change from pho, try bun bo hue. 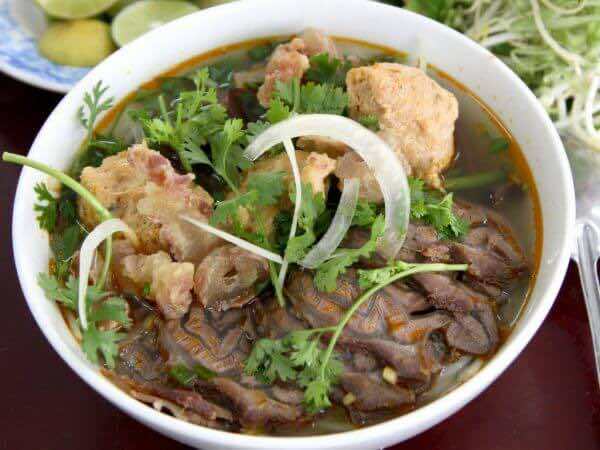 This dish is made with lemongrass and chili, its broth both citrusy and strong, laden with thick cuts of meat. Paprika or annatto oil render the broth its fiery orange colour, and fermented shrimp paste lends a complicated layer of taste. The green serving with it is boiled glory morning and boiled bean sprout. Bún bò Huế Vĩ Dạ Xưa – E008 No6, Hung Vuong 1 Area, Tan Hung Ward, District 7, HCMC. Although Vietnam is not the place of origin of bubble teas, the locals, especially the young, are really interested in drinking milk tea these days. Milk tea, and its family of bubble teas, has been around for decades in various forms. 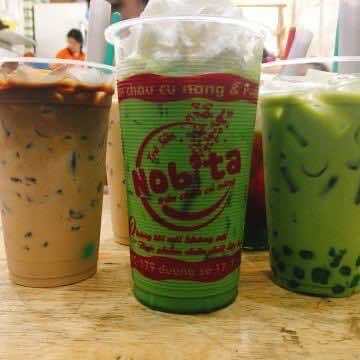 The most popular style of milk tea is a simple blend of black tea, creamer and sugar, chewy tapioca pearls, especially chestnut cover by tapioca flour and usually served cold with ice. Fruit-flavored bubble tea is also available in an assortment of flavors such as mango, lychee, strawberry, honey and green apple. Trà sữa Nobita – 179 No17, Tan Quy Ward, District 7, HCMC.